Start of H-BC 2015 Football Season. 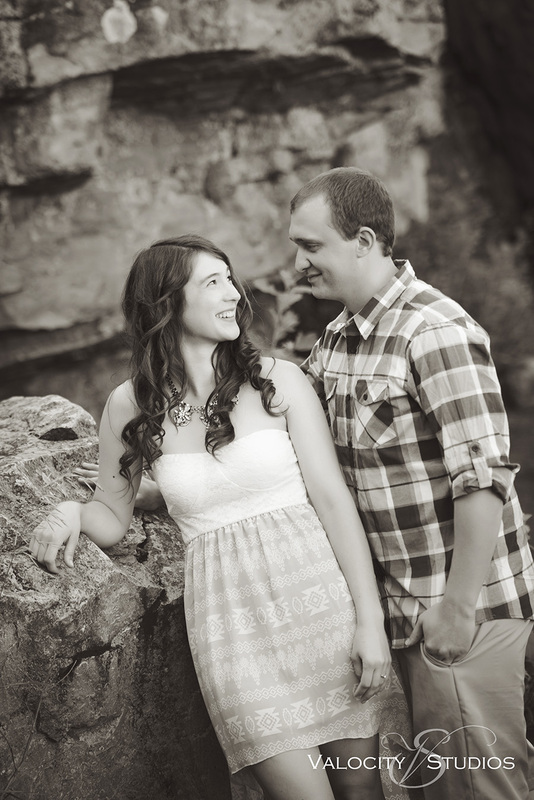 They met during college..from different towns in South Dakota, and some how ended up together. Rochelle can't be missed with her contagious smile & loving personality. I see why Aubrey fell in love with her so easily! These two were incredible to photograph as their enchanting personalities meshed quite well. Other than me giving them a little direction here and there, they acted like I wasn't even there. Just two lovebirds enjoying the scenery at the Pipestone National Monument. IT.WAS.AWESOME! I will just have to keep my patience for when I get to photograph them at their upcoming wedding in October. Two weeks ago, I was involved in the Lyon County Fair in Rock Rapids, IA. Every year, its HOT!! This year was no different. On Monday, the heat index was 100˚+. Us vendors weren't as busy that first day, so I had the opportunity to weed out images on my laptop. Boy, did I have a TON of pictures on there! That's not my work computer either. After those 3 days were up, I had deleted over 9,000 images! YUP you read that right. At the same time I realized I had only printed probably 100 of the images left on the computer. 3+ years of memories and only 100 printed?! What would happen if my computer crashed? Those memories would be lost forever! It made me think of how precious these memories are! I do have all of my images backed up online (the important ones anyway). I've learned with the purchase of my new computer that backing up to a CD is useless as the computer doesn't even have a disc drive in it anymore. I do back up a few images on a flash drive and put it in my firesafe box as well...but what ever happened to PRINTING images?! Are we the digital age where we ONLY show them on Facebook, Instagram, Twitter, etc? What will our kids and grandkids have to look at after 50+ years. They won't even know where to begin looking for images of you and your family. We can't let this digital age help us forget about looking back at those good ole' memories! You don't have to print ALL of your images (like my 9,000 I deleted) but make sure you have a hard copy of those important ones! I LOVE small town weddings! I love them even more when I'm familiar with the area! This blissful day was in Lismore...and they finished off in Worthington. I'm pretty sure the bride was a bit apprehensive about the not-so-blissful weather. I checked my weather app that morning, only a 20% chance that day. Well, it ended up down pouring a couple of times and sprinkles off and on throughout the afternoon. That didn't stop any of them from enjoying it! Besides, I've heard a rainy wedding day is a sure thing to a prosperous marriage, right?! Here's the video from Brandon & Marriah's wedding. Each year our church has Vacation Bible School right after Memorial Day. They always need someone to take pictures for a "spotlight" video. This video is a summary of their lesson each day with pictures of the kids to help explain what they learned. I get lucky enough to be asked to do it for VBS every year. (Yes I do love it that much!) I have a book with instructions on what kind of pictures to take. It will actually say "group of kids reading Bible" or "kids singing". Sometimes the kids get something a little crazy to do and are excited to do it knowing they'll be in the video at the end of each day. I do my best to capture images of ALL the kids each day (We had 109 this year) This year's theme was Weird Animals & most of the Bible stories were about someone being "different." This video is about Vacation Bible School 2014- Weird Animals - @ the Reformed Church of Steen. Since we had no school in the SW MN area yesterday due to the Easter holiday, I figured it would be a great day to photograph another 2015 High School Senior Model! I didn't realize how windy it was though. My beautiful model, Kyla, had nice, long hair.. It seemed much longer with the wind going 30 mph outside! We just took a few more pictures indoors in the studio. I also styled her hair and did her makeup for this session. Here's a video of some of the images captured yesterday. Hair and Makeup completed by Valerie. Images taken at Valocity Studios in Hills, MN. This year, we are are doing our Senior Model program a little bit different. All of the girls' clothes are from Lillians of Rock Rapids. I also do their hair and makeup before the model session. These are 2 stressors they don't have to worry about then. It's a win-win for both of us as editing the images becomes minimal since their hair & makeup are complete. Bryanna, from Luverne, MN, did a great job as it was only 30 degrees out and she was in light clothes! Find Bryanna and ask her how you can receive a discounted session for your senior portraits at Valocity Studios. I recently attended a workshop on pet photography in Sioux Falls, SD. Unsure of whether I really wanted to do this or whether there was a market for it, I did a little research, but left it be. I am in a small town of Hills. Just 5 days later a family comes in with this HUGE dog for their family and children's portraits. I figured, why not, right?! It's like this dog was begging me to photograph him! He was the laziest big dog I've ever seen! So, while mom was changing the girls' clothes, I captured a few images. (as well as ones with the family). It was definitely easier and more fun than I expected! I have a new website! It's been lots of work, but I'm excited about the ease of accessibility for everyone!